We have a large collection of 170 different types of South Indian Curries and South Indian Vegetables. Yes, it's clearly evident that different types of South Indian Subzi recipes are super popular not only in South India but all across our lovely country. Most South Indian curries are dry or semi-dry. Dry curries are made by sautéing veggies with a tadka and a garnish of coconut, while semi-dry ones are cooked with veggies, dal and a masala paste that is usually coconut-based. Take your pick from South Indian curries like Cabbage Poriyal, Avial, Kala Chana Sundal and Chettinad Curry , and enjoy them with a bowl of hot rice. Tomato Gojju is a spicy tomato curry with shades of tanginess and sweetness too. The Mangalorean Drumstick Curry is traditional fare along the Kerala and Konkan coast, which use coconut generously in the masalas and garnishes. An all-time favourite South Indian curd curry, the Morkuzhambu is marked by its mild tang, creamy mouth feel and rich taste. Look for a spicy curry from Tamil Nadu, try the Chetaniad Curry. Vegetables in Coconut Curry or Valval is a classic mixed vegetable preparation from the Western coastal region, where coconuts grow in plenty and are used abundantly in the cuisine. Idiyappam and Appam would be incomplete without a bowl of this mouth-watering Vegetable Stew. Cabbage Poriyal : Poriyal is any dry vegetable preparation flavoured with generous amounts of fresh grated coconut. Cabbage tempered with mustard seeds and dry red chillies makes a delightful accompaniment to any South Indian main course. Cabbage with coocnut make a nice Cabbage Thoren stir fry. Pongal Kootu is a tongue-tickling mixed vegetable curry made during Makar Sankaranthi or Pongal in South India. It is made with local vegetables that are in season at the cusp of winter and spring. Rare is the wedding or festive menu that does not include Avial! the key to making excellent avial is to pay equal attention to the visual appeal – vegetables with contrasting colours such as carrot, beans, pumpkin etc are chosen, sliced evenly into thin 1 inch long pieces, and cooked to a crunchy consistency. 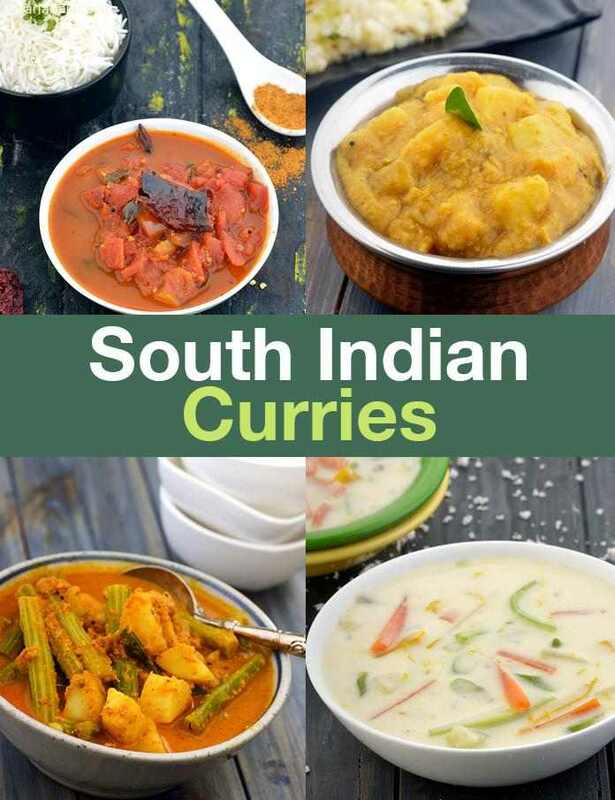 Enjoy our South Indian Curry Recipes, South Indian Vegetable Recipes and Suth Indian Recipe articles given below. Here's a spicy curry from tamilnadu that tastes best with steamed rice. The chettinad masala for this curry can even be made a week in advance and stored in air-tight bottles. The potato song is inseparable from the cuisine of goa and neighbouring regions along the western coast of india. This simple yet aesthetic dish blends with the idyllic and scenic environment along the coast! All recipes very yummy. Nd very tasty. I want to sweet recipes. Tarla Dalal Hi, Thank you for your kind words. Do try more and more recipes and let us know how they turned out. Happy Cooking ! !